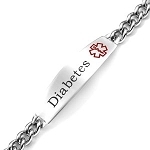 This curb link medical ID bracelet is pre-engraved on the front with Diabetes. 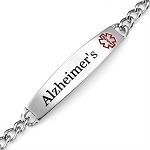 The back may be engraved with medical or emergency contact information. 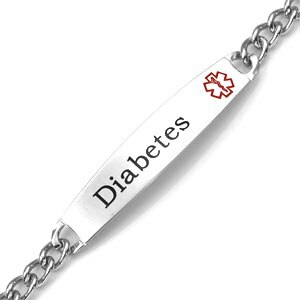 Displays a red Medical alert symbol on a plaque that measures 1/2 inches by 3/8 inch. 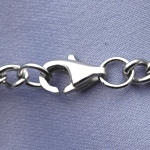 Wrist size should be approximately 1 to 1 1/2 inch smaller than stated length of bracelet. Attaches with a lobster clasp. 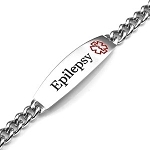 Made of hypoallergenic and non-corrosive 316L surgical stainless steel, also known as marine grade stainless steel due to its increased resistance to chloride corrosion compared to type 304.